I run two community choirs called Clarity Choir, which I lead using the principles of the Natural Voice Network. I was trained using this method by experienced choir leader Candy Verney. 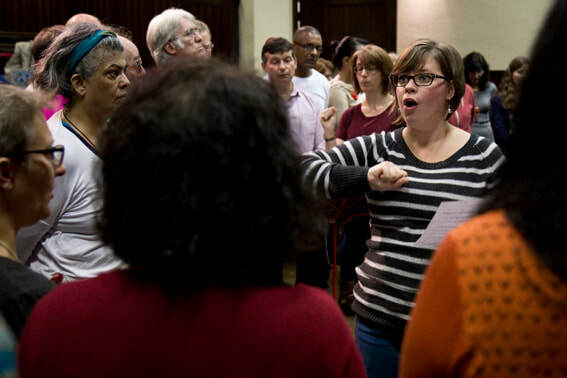 They are both open-access, a cappella choirs that are as much about the social and community aspect as they are the singing. Performance dates are listed on the Clarity Choir page. I have also recently set up Bratton Sings! - a new community choir for the village of Bratton in Wiltshire. aim to accommodate mixed levels of experience. aim to avoid using technical language and musical jargon. use physical and vocal warm-ups to facilitate vocal health, confidence and fun. I am a leader for the Mill Race Singers, a group of learning disabled adults from the Mill Race Activity Club in Calne. We meet monthly and sing songs from around the world, usually adding movement and percussion as well. This project was set up by the Trowbridge Song Project in 2016 but is now funded by Wiltshire Rural Music (since January 2018). I have set up an a capella singing club for pupils at St Laurence School in Bradford on Avon and in May I will start a series of whole-school singing workshops at St Michael's Junior School in Bath. I am available to run singing days in local businesses and clubs in Trowbridge and surrounding areas throughout the year. These can offer businesses and their staff the opportunity to sing together for a day. For more information about my choirs, if you'd like to book Clarity to sing at an event, or if you'd like to host a singing day in your workplace or club, please get in touch via the Contact page.